Summer of 2016 had public shows in Michigan, Indiana and Illinois. The shows were at libraries, schools, park districts, entertainment series, and festivals. It is always great fun to perform for these groups. The families come out for fun. The show is fast moving fun and teaches science. It is great when both adults and children come up and tell me how much they learned (and laughed). 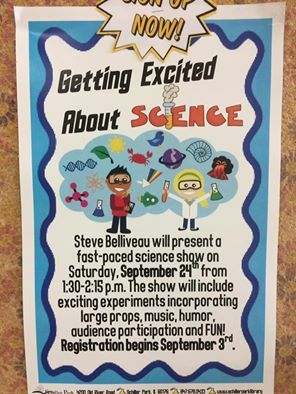 This entry was posted in Science Show. Bookmark the permalink.